I just noticed in my Google Plus account, a column of suggested friends. This is not new in social networking websites, but this is a new feature in Google Plus. Twitter, Facebook already have this feature. Suggested friend column is located in right sidebar. Friend suggestion must be very accurate as Google knows you very well. 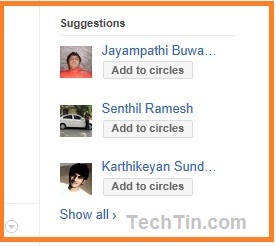 Friend suggestion is based on your gmail contacts, common friend of your friends, interest etc. Google plus just made a very unsettling friend suggestion to me. It is someone that works in the same building, but for a different company. To my knowledge, I have had no online interaction with this person at all. I find it very disturbing that Google has made the connection between myself and this person. I can’t help but feel that my privacy has been invaded. Has anyone else had this experience?